Once upon a time — more than a decade ago — an Italian motorcycle company with a history of offbeat scooters decided to make a big push into the booming European scooter market. The designs, notably the Swatch/Vespa-hybrid Velocifero and the ahead-of-its-time Dragster captured the public imagination worldwide. Since Italjet were Italian, they inevitably botched it all up, closed up shop, licensed their models to Kinetic in India, then annually announced the rebirth of the Dragster (vaporware!) at EICMA while slapping “Italjet” stickers on cheapo Chinese bikes for the European market. One model briefly made it to the U.S. during this period, a cheap Chinese knockoff of their own late-90s Torpedo. Meanwhile, Kinetic chunked out one uninspired model, the ex-Italjet Millenium, as the “Blaze” for the Indian market, and teased the world with an occasional Velocifero press release. But all that’s about to change! I’m going to bring Italjet back MYSELF! We “Autoprima” situated in india city of Pune(near Mumbai) where this is Automotive industrial hub and the manufacturing company for Italian ITALJET scooters. 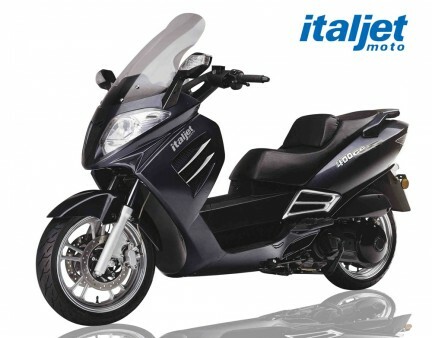 We are export dealer of KINETIC -ITALJET and having “italjet millenium 125 C.C. scooters 4 stroke and 100 C.C. 2 stroke in our stalk as well inventry of Parts . You may forward this to the perspective buyers of ITALJET scooters.We will apreciate if you contact us for further business oportunity. Yes, I want a scooter so bland and outdated that it’s named after a point in time, ten years ago. I’m dialing as soon as I can find a replacement battery for my Nokia 101. Italjet is back, the end. New hope for Indian Italjets? Remember Kinetic Motors and their plan to produce seven Italjet models in India? Only one (The Italjet Millennium, renamed the Kinetic “Blaze”) ever came to market, and Kinetic was bought out a year ago by Mahindra & Mahindra. Now M&M is reconsidering Kinetic’s Italjet plan. If you’ve been pining for a new Velocifero or Dragster for the past decade, you’ve seen your dreams crushed by Italjet, Italjet’s various US importers, Kinetic, Italjet again, and Diamo/LS Motorsports, so we don’t see how your luck is going to change, but maybe this will give you false hope again. Author illnoisePosted on 23.09.09 Categories Diamo (and Italjet), Kinetic (and Italjet)8 Comments on New hope for Indian Italjets? Italjet once again mocks reality by displaying the Dragster (with a new sticker!) at EICMA. The Italjet.com and ItaljetUSA.com websites remain frozen in time in 2005, their entire corporate reputation resting on the unlikely return of an overrated ten-plus-year-old scooter. Can you imagine a company so hopeless that China won’t even touch it? India-based Mahindra & Mahindra is considering a purchase of Malaguti Moto. M&M recently bought Kinetic Motors, and thus owns the rights to several Italjet models. Malaguti, like Italjet, produced several popular scooters five years ago, even making brief appearances in nascent American scooter market. Today, both manufacturers appear to be limping along selling a combination of 2003-era bikes and less-inspired newer asian-made models. Another entrepreneur whose intensity, curiosity, research, and devotion to quality impress me is a gentleman who first flagged me down on an East Hampton back road several years ago. 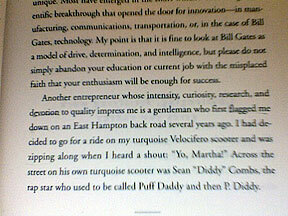 I had decided to go for a ride on my turquoise Velocifero scooter and was zipping along when I heard a shout “Yo, Martha!” Across the street on his own turquoise scooter was Sean “Diddy” Combs, the rap star who used to be called Puff Daddy and then P. Diddy. Thanks for the photo, Dawson. Hi. I would like to buy one of your Italjet Dragster motor scooters. What’s that you say? You don’t have any? THEN STOP SPAMMING CRAIGSLIST WITH BIKES THAT DON’T EXIST. Oh, and thanks for blatantly lying about parking and license requirements, too. You’re making scooter dealers everywhere proud. P.S. Steve/Mathu/Diamo/LS, is this the kind of behavior you encourage in your dealers? Spamming, bait-and-switching, and lying on Craigslist? Great. Italjet has launched another model in Europe, the 2-stroke 50cc SX1. Brooke recognized the engine as a CPI design, though the body appears to be unique in its generic-osity. Italjet’s European site has been “under construction” for some time, so details are thin on all their bikes, but so far, they’re marketing what appears to be a CF Moto Torpedo clone, this generic 50cc CPI-powered snoozer, a Kymco Agility with custom bodywork, and a Chinese 400cc cruiser that six other companies are selling, while continuing to hype an overpriced 650cc Hyosung sportbike (the Grifon) and a Piaggio engine (likely Chinese-made) that may someday be wedged into something resembling a 10-year-old Dragster frame. The Roller Craft is at least distinctive, but expensive for a 50cc Chinese-made scooter, and it’s not available yet, either. Even if you consider any or all of their bikes exciting, there’s no parts/service consistency to the lineup at all. U.S. importer LS Motorsports is planning to import the Torpedo, 50.it, Roller Craft, and Dragster (of which only the Torpedo is currently available). Italjet’s strength back in the turn of the millenium was innovative design, yet they sold the tooling for many distinctive models to Kinetic in India. Their success is arguably dependent on the promise of an updated and well-built Dragster, yet they keep wasting time and money developing these thinly-disguised and indistinct Asian bikes. Sure, it’s important to have a full line, the Dragster’s not for everyone, but the Dragster will be what brings customers into the dealership and builds their brand recognition. There’s little evidence of progress on the Dragster front for the last two years, and at best, a new Dragster is likely still a year away. If we do see a Dragster in 2009, it had better be worth the wait, which is to say it must be better than the original (let’s be honest, even the original had flaws). Nothing Italjet has done since they resurfaced is providing much evidence that it will be. Steve Guzmán spills all the beans he can on the Dragster over at the Scooter Scoop. He’s working for ItaljetUSA, of course, but it seems like a pretty honest piece, he answers a few questions, and includes a couple photos of a prototype that’s newer than the one on display at Dealer Expo that I haven’t bothered to write about yet. Hopefully, bringing Steve on board wasn’t the only thing LS Motorsports is going to get right. Author illnoisePosted on 27.03.08 Categories Concepts/Innovation, Diamo (and Italjet)3 Comments on The Dragster Scoop? Just got a press release from LS Motorsports about new consumer financing plans on Diamo, Italjet, and Fischer scooters and motorcycles, just in case you wanted to have your Dragster loan paid off before the bike came out. (And they spelled “Fischer” wrong.) Before you accuse me of being mean, you should know I haven’t posted my LS DealerExpo writeup yet, because I don’t want to hurt Guzmán’s feelings. I’m a smooth criminal. Can you tell I’ve been reading too much Wonkette? The critical words used when Italjet products are discussed have their origin in the frustration felt when their excellent concepts often fail in the execution of delivering the legendary products we hope for. The Velocifero, Dragster and Formula models made it far when reaching for iconic status but fell short in the end due to poor product support and the ultimate demise of the company’s incarnation at the time. Some exciting designs have yet to make it from prototype to production. Examples include the Scooop, Rollercraft and Amarcord. While the Scooop may have been outdone by the Piaggio MP3 in arriving first and the Rollercraft may yet arrive, the motorcycle-with-a-scooter-engine work of art known as the Amarcord seems to have died and it’s name lifted onto a Chinese scooter. Reported by Cyberscooter.it from the EICMA in 2007, the scooter with the Amarcord name appeared as one of Italjet’s new offerings. The scooter doesn’t look all that horrible it is slightly reminiscent of the Velocifero’s retro design with some tell-tale accents of mainland-China construction. Also note the yellow Rollercraft model in the background. What moves me to feel sad and mourn the loss of the of a great design is that the name transfer of the Amarcord label from an incredibly eye-catching and novel design to an homogenized standard scooter signals the death of an idea that’s time is ripe and appears to be lost on most (but not all) manufacturers. R.I.P. Amarcord concept. Italjet has announced their new 400cc Marco Polo, and the French (and I) have scooped Italjet’s U.S. marketing director. It looks nice, I’d love to see it in person. Next weekend. At Dealer Expo. The full US Italjet product line can be viewed at DealerExpo at booth number 3711. The vehicles present will include the Dragster, the Roller Craft, 50.it and the Torpedo. Also present in the booth will be Diamoâ€™s new 4X4 UTV and ATV (500cc and 700cc), a new Diamo 50cc scooter, and the Fischer motorcycle. As we mentioned before, it’s going to be a long weekend for Steve if those bikes get “stuck in customs.” Sometimes I’m jealous when friends get jobs in the scooter industry. All I have to show for my 12 years writing about scooters was one crumby quote in a Genuine Blur ad, and I didn’t even get paid-off for that. (I had to actually pay for my Blur, oh, the horror!) But I guess when it comes down to it, I’d never quit my day job refereeing tennis matches.